Colors: Gold and Black; Paracelsians wear a black tie. Students in Paracelsus Court value empiricism, skepticism, experimentation, and connecting theory to praxis. They constantly seek to expand their knowledge through practical tests, and believe in the physical and magical unity of the cosmos. They are also known for throwing the best parties at Imperial: they value excellence in all things, so they work hard and play harder, and they apply their empirical rigor and potions prowess to ensuring their parties and functions are a measurable success. There are legends of Paracelsus parties throughout the Court’s history: the time they transfigured their common room into an Egyptian tomb and everyone experienced death and return; the time they held a country party on a Court member’s estate that included each person with their own wyvern or pixiu to ride; the Victorian table-rapping experience where everyone left behind their physical bodies and partied in the paranormal. Court members also are typically adept at potions-making and have a brisk underground sale of commonly needed items, as well as fantastic concoctions of the aesthetic and alcoholic varieties for their “study breaks.” Aulathar Taninthil, the creator of Shining Moon Dionysian Elixir, is a Paracelsus alum. Paracelsus students focus much less on magical theory than students in other Courts; some scorn it all together, even to the point of protesting needing to take classes in it. Why bother studying intangibles when there are real objects to be examined and explored? Theory is derived from observation, analysis, and cataloging, which Paracelsians are happy to do. If they can be said to have any guiding principles of magical theory, though, they can be found in the hermetic paradigms that their namesake followed, and that derive from earlier practices of Spain, the Middle East, and Persia. Many graduates of Williams Court at P2A4 go straight into Paracelsus Court at Imperial because of the similarities between the two approaches. For instance, many Paracelsus students hold to the principle of microcosm/macrocosm: living entities are smaller manifestations of a natural whole, and magical beings — including mages themselves — are embodiments of the magical flow of the universe. Thus, they practice alchemical transmutation of substances, breaking objects down into component parts, enhancing and extracting the portions they need, then recombining those parts into new manifestations that perform the functions for which they have been engineered and created. The principle of microcosm/macrocosm informs their study of healing, too: if human beings are a manifestation of cosmic unity, then understanding the human body is a critical step along the path to understanding the universe itself. Sympathetic magic is also popular among Paracelsus students: the idea that a spell, artifact, potion, or plant has a more powerful effect if it resembles the target or desired goal. Alchemists and healers, following the example of Paracelsus himself, sometimes concoct potions with components that resemble the part of the body that the potion is meant to affect: walnuts for headache cures, for instance, or beet juice for potions that affect the blood. Similarly, those who practice artificiery try to craft items whose appearance indicates their use or effect: miniature fans or snowflake-shaped crystals for cooling charms; or tiny doors and locks in protection amulets. This principle is also used for understanding plants themselves: the plant demonstrates its magical qualities through its design: thorns for defense or attack, for example, or for a complex issue or ailment. Paracelsus students tend to be more hands-on than many Imperial students, because of the practical nature of their studies. They can often be found digging in the garden and greenhouse, creating potions in the alchemy lab, or setting up elaborate experiments in their common room or the classrooms. All place great value in experimentation, but whereas some believe that it is important building on the precedent of past experiments; others believe that to truly know anything you must learn it yourself through direct experience. This emphasis on physicality in Paracelsus leads many students in other Courts to feel themselves superior for not needing to be dependent on “mere” materiality for their magic. Mundane-born students in Paracelsus are especially looked down upon; it is often whispered that Mundane-born students take refuge in Paracelsus because they don’t need to use their magic at all. Paracelsians respond to these insults, swiftly and quietly as these naysayers “somehow” or “inadvertently” come into contact with a toxic plant that causes any matter of rashes, poxes, boils, blisters, or other physical annoyances. Above all, Paracelsus students believe that every aspect of the natural world is worthy of study: the human body, animals, plants, minerals, air, water, and their interactions. They excel in botany and herbology; their favorite spot on campus is the living labyrinth that was inscribed in the earth by their founder, Isaac de Lucena, and they still tend the plants descended from the ones that he brought with him from South America in the campus greenhouse and gardens. They bring their philosophy about the embodiment of magic into their approach to the natural world as well: if magic can be harnessed through the construction of potions and artifacts, it can also be imbued into living things, and a plant’s magical properties can grow as the plant grows. If a flower can be bred to have a scent that attracts birds and insects, then a flower can be bred to exude magic through its scent as well. Likewise, plants’ physical forms can hold the key to their medicinal or magical use. As their namesake Paracelsus himself observed, medicinal plants often resemble the part of the body that they are especially suited to treating, thus demonstrating how magic manifests itself into physicality by means of the natural world. Many Paracelsus students therefore use magic to shape plants according to their needs, by means of topiary arts and other physical methods; others simply show their appreciation for the aesthetics of plants through well-crafted gardens and flower arrangements. While most applications of magical botany are peaceful, this technique of plant-shaping and enhancement can be put to more aggressive purposes as well: animated vines that restrain or constrict, razor-sharp thorns, giant Venus flytraps, and more. Thus pruning, arranging, and designing plants creates and heightens magical effects, such as living ritual circles, or bouquets, corsages, or boutonnieres, whose combination and ratio affect the wearer. When Paracelsus students are caught in scandal, most often it is for creating poisons, concocting forbidden potions, or experimenting with forbidden flora and fauna. A few Paracelsus students have been expelled over the years for selling Concentration Concoctions and other memory enhancers for the purposes of cheating during exam time; others for making love potions, which are of course forbidden at all times. The worst incident was in 1895, when Luis Avila nearly killed half the Court by creating a hybrid cactus cat that oozed poisonous catsap; even the fact that he then performed a remarkable feat of quick spellcasting and created an impervious barrier to contain the creature couldn’t keep him from being expelled. Most of the time, when Paracelsus students are caught dabbling in poison, they claim that they simply need to know about poisons so they can better devise antidotes for them, and most follow their Court’s namesake in believing that even the most dangerous plants and potions are worthy of study as part of the natural world. As Paracelsus himself said, “the poison is in the dose” not in the substance itself. Paracelsus students feel that their empirical approach gives them a more thorough understanding of their studies: skepticism is necessary to prove whether a hypothesis is correct, and there is no room for anything but perfection in their fields of study. Imprecision will mean the difference between healing and poisoning, between life and death. Sometimes Paracelsus students can be too skeptical: they insist on higher standards of evidence than anyone can possibly meet, or ask so many questions that they lose sight of the big picture. They always want to test theories themselves, valuing independent work highly; their namesake’s own motto during his life was “Alterius non sit qui suus esse potest:” let no one belong to another who can belong to themself. They also have a tendency to engage in black-and-white thinking – again, either a potion works or it doesn’t, and they don’t often find much value in exploring the gray areas that are common to other types of magical practice. But that same skepticism makes Paracelsus students valuable partners in experiments and projects. They will always help their fellow Court members test their work, cooperate in experiments, ask probing (but helpful!) questions to sound out the validity of their friends’ theories, and offer the best evidence possible in answer to a question. Being serious about their work, however, does not prevent Paracelsus students from having fun — in fact, they are known for throwing some of the best parties at Imperial. The same meticulous skill that creates alchemical concoctions can be applied to the creation of mixed beverages (and occasionally also some recreational mind-altering potions!) as well as enchanted decorations for the Court’s common room or students’ dorm rooms. Two types of students in Paracelsus should be particularly noted. First, religious students of every faith tend more often to find their home in Paracelsus. This Court’s founder and namesake were religious men, and both felt that exploring the workings of the natural world was a way of understanding divinity. Though they had to maintain a distinction among magic, the occult, religion, and science to outsiders who would persecute them, Paracelsus and de Lucena had no such division in their own psyches or practices. Therefore, many magical students with a strong religious faith or identity feel they fit well in Paracelsus. Of course, not all Paracelsus students practice a religion, just as not all magical or mundane people practice a religion; and in Paracelsus as in the Magimundi as a whole, it is equally acceptable to be religious in any faith or in none at all. Second, women. Paracelsus Court also includes Aspasia, the former women’s court, which was founded in 1890 when women were first allowed to attend Imperial Magischola. Aspasia Court focused entirely on the study of healing, since that was one of the few paths initially open to women students (a compromise to get Imperial re-opened at all). Its namesake is Aspasia the Physician (c. 300 CE), a Greek wizard who pioneered several techniques of magical surgery. Because healing is so closely connected to alchemy and herbology, when Aspasia was incorporated into one of the main courts in 1938, it was combined with Paracelsus. There is no longer an Aspasia Court – Paracelsus, like all Courts at Imperial, admits students regardless of gender – but some women in Paracelsus still commemorate this part of their court’s history in various ways. In particular, since Aspasia Court’s colors were yellow and white, some women in Paracelsus like to wear a bit of yellow or white in honor of that history. Agrippa: We are unsettled by Agrippa’s interest in phantasmology, and irritated by their insistence on searching for hidden meanings when a straightforward solution is already present. But we admire Agrippans’ sense of justice and willingness to grapple with complicated issues. Callimachus: We are disdainful of Callimachus students’ lack of precision, and often criticize them for favoring style over substance; but admire Callimachus students’ drive for self-improvement. Paracelsus: We are impatient with Ptolemy students’ insistence on looking to the past rather than the future, but admire their skill in interpreting natural phenomena of the sky and stars. L. Hathaway, Class of 1910, one of the many many Paracelsus students who have attempted to create a potion of immortality. They failed to become actually immortal, obviously, and succeeded only in delaying their departure from this world by becoming trapped as a ghost. Hathaway’s potion was intended to make both consciousness and body more durable: they failed at the latter, and only partially succeeded at the former. Their body died, and their consciousness now wanders independently as a ghost — but their consciousness is preserved in exactly the same condition as it was at the moment that they consumed the potion. Unlike other ghosts, they cannot learn or grow, or even make new memories. Families commonly in Paracelsus Court: Radcliffe, Pengry, Ribault, Collier, Schaefer, Fiske, Campanal, Cohen, de Lucena, Bradford. Hecate “T” Henderson: the chief alchemist at the Bureau of Metallurgy, Alchemy, and Crystallography. Aulathar Taninthil: the creator of Shining Moon Dionysian Elixir. The Pleiades: the first women to enroll in Aspasia Court, all graduates of the Class of 1893. Regina Avila, Josephine Braithwaite, Nellie Burgess, Marie-Claire Charpentier, Tryphena Forsythe, Rachel de Lucena, Philomena Radcliffe. Luna Chavez: the Arch Justice of Baja Province. Philippus Aureolus Theophrastus Bombastus von Hohenheim, aka Paracelsus, was a Swiss doctor, alchemist, and astrologer. He advocated skepticism and moderation, and valued inquiry into all aspects of the natural world, heaven and earth alike. He believed in the doctrine of one nature: that body, mind, and environment were all one, and therefore that all of those aspects must be taken into account when affecting any one of them with magic. He was also associated with several secret societies dedicated to exploring the esoteric and the occult, and to finding and fostering connections among different types of knowledge from antiquity in search of holistic theories and magics. He was born into an academic wizarding family. His mother, a researcher of magical theory, sadly died young; so he was mainly raised by his father. The elder von Hohenheim was a professor of alchemy pursuing several of the classic challenges of that field, including immortality potions and the transmutation of lead into gold. Von Hohenheim studied in the great magical universities of Vienna, Ferrara, and Constantinople, but was never satisfied with what he found there. He felt that he had a greater understanding of the nature of magic than he was receiving from the fractured incomplete teachings of his professors, and that he was destined to achieve greater things. The pen name “Paracelsus,” which he adopted at this time, reflected this ambitious belief: it means “beyond Celsus,” i.e., surpassing the Roman wizard Celsus whose writings formed the core of the university healing curriculum at the time. “The universities do not teach all things,” Paracelsus wrote; “knowledge is experience.” Von Hohenheim believed that everything in the universe was connected: that humans were small parts of a larger whole; and that humans’ use of magic allowed them to share in the greater mysteries of the universe. Striving to find concrete applications for the theories that he had learned from his father and his professors, he turned towards the physical realities of the natural world and the human body alike: practical alchemy and healing. He even served as a field-medic healer in the 1517-1518 war between the Tovenaarschurken wizards in the Holland conflux and the North Atlantic merfolk. Later in his career, Paracelsus’s contempt for non-magical healing methods brought him into conflict with the mundane authorities. He publicly burned several mundane medical books and spoke out against local doctors wherever he went. Unsurprisingly, his provocative actions resulted in his being chased out of several universities, and meant that many of his most important works on alchemy and medicine were not published by either magical or mundane presses until after his death. Paracelsus’s theories of healing focused on moderation: not too much food or drink but not too little; balance between heavenly and earthly influences in a person’s life; harmony between one’s magical body and physical body; an awareness of one’s effects on the world. He also understood that that might mean different things for different people: that each person has unique needs, and that what might be too much for one person is just enough for another. He believed that with the right combination of material and magical medical practices, a person’s lifespan could be extended well into a second century. He carried on his father’s work on immortality potions, and while he did not succeed at that, he did devise the potions that currently enable wizards to routinely live past 100. Paracelsus was also a Christian, and saw no conflict between his faith, science, and magic. In fact, he believed that each complemented the others. To him, the natural world was a divine creation: not only the stars and heavenly bodies that he examined through his astrological practices, but also the earth and the material world. Even poisonous plants were part of creation, and so they too were worthy of study. Everything deserves inquiry and attention, and all ideas deserve to be tested. Magic itself is an expression of the divine, and thus the persecution of the occult by Christians was particularly puzzling to him. With regard to his legacy at Imperial Magischola, Paracelsus was a wise and diplomatic choice for a Court namesake on the part of founder Isaac de Lucena. Paracelsus was one of the leaders of the Renaissance wizarding reforms that Leodegrance, the previous chancellor, hated. But, Paracelsus was also distantly related to Leodegrance through the Bombastus line, so Leodegrance’s supporters couldn’t object too strongly. Born in the Dutch colonial city of Mauristaad (now called Recife), Brazil, Isaac de Lucena was the youngest sibling in a large Sephardic Jewish family of distinguished magical lineage that they traced back for centuries to Spain. They carried on that tradition in the New World as well, becoming one of the most prominent magical families, involved particularly in business and trade. Isaac was the most scholarly of the family; having no interest in business, he spent most of his time studying under the leader of the local Jewish and wizarding community, Rabbi Moses Aguilar. In addition to the latest European post-Renaissance-Reform magical practices, Rabbi Aguilar trained Isaac in the Solomonic traditions, and the hermetic theories of Spain, Persia, and the Arabic-speaking world. Isaac was incredibly quick to learn: by his early teens he had already mastered several runic alphabets as well as several advanced hermetic texts. He was also deeply curious about all aspects of magic — often, too curious for his own good. When he was fifteen, he discovered an unfamiliar plant in the rainforest near his home, and decided to test its magical potential by using its flowers in a potion. Unfortunately for him, it was actually the poisonous parabotanical blossom commonly known as moth-wings, and Isaac nearly died from the toxin. The quick thinking and expert alchemy of his tutor saved his life, but Isaac was physically weakened ever after. Where some people might have been so frightened by such an ordeal that they changed the course of their studies, Isaac instead became even more fascinated by alchemy and botany. Once he had recovered enough to work again, he dedicated himself to gathering samples of as many plants as he could and investigating their magical properties. When Mauristaad fell to the Portuguese in 1654, the de Lucenas fled north to New Amsterdam, where Isaac immediately started to explore the botanical and parabotanical potential of his new environment. When he saw the crumbling stockade around New Amsterdam, he experimented with magical ways to strengthen the wooden fortifications; when he experienced his first northern winter, he set about finding ways to help his plants endure the cold. 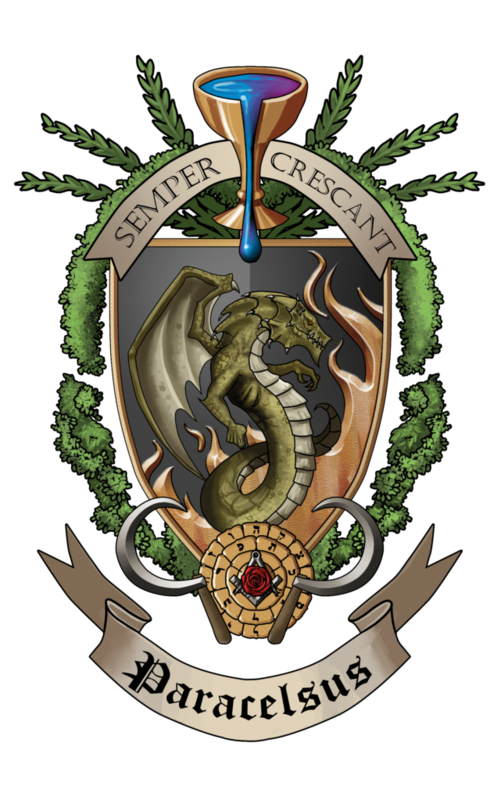 Eventually, Peregrine Myles Brewster recognized the great skill and talent that must have gone into Isaac’s ambitious creations, and invited Isaac to join the faculty of Imperial Magischola as a professor of alchemy, founder of a new Court, and reformer of the university. He was only 28 — a prodigy, and also the youngest of the founders by several decades. When it came time to choose a namesake for the new Court, de Lucena made a wise and diplomatic choice. Paracelsus was one of the leaders of the Renaissance wizarding reforms that Leodegrance had hated. At the same time, Paracelsus was distantly related to Leodegrance through the Bombastus line, so Leodegrance’s supporters among the Praestantes couldn’t object too strongly. Also, in keeping with de Lucena’s approach to the world, Paracelsus believed in independent inquiry, skepticism, harmony, and looking more to the future than to the past. As a professor, Isaac de Lucena continued to look towards the future. He planted his precious seeds and cuttings in the new greenhouse, where their descendants still grow today, and found ways to get his South American plants to grow alongside native species. He corresponded with his family in Europe to obtain the latest texts in alchemy and hermetic theory for the Imperial Magischola library. He proved to be an enthusiastic if slightly erratic teacher of botany and alchemy. He much preferred teaching upper-level classes, where he could not only cover more advanced material, but he could also learn along with his students, recruiting them to join in his continual experimentation. Only reluctantly did he take on the duties of teaching the youngest students — although the Praestantes generally preferred him to take those classes because he caused much less damage to the alchemy lab when he was teaching beginners. He also made sure that Imperial Magischola was a welcoming place for Jewish students of all ages, even talking to the parents of the younger students (of the ages that would now be considered primaschola students; then, it was all a single campus) to help set their minds at ease about the new environment.